If a pipeline explodes and only trees are burnt, does anybody care? 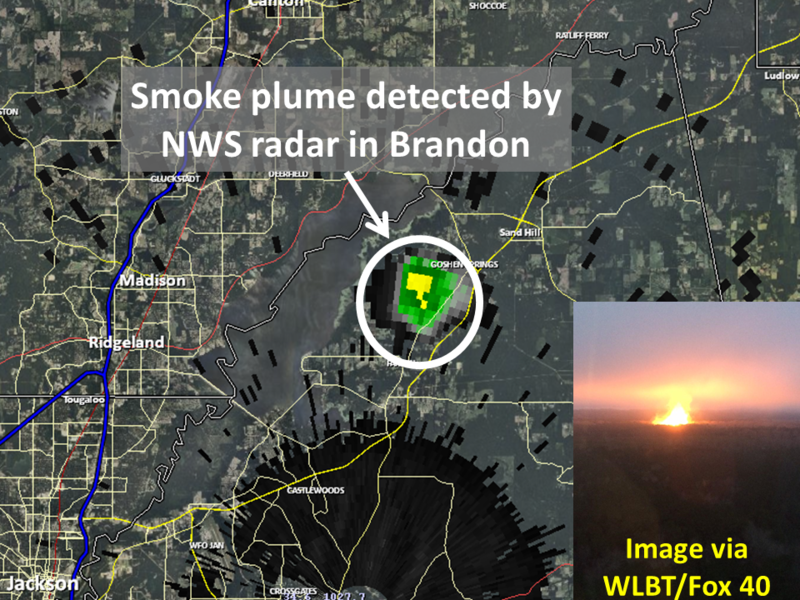 This one was picked up by National Weather Service radar. Have you ever heard of solar panels exploding? Valdosta, 8 March 2014 — SpectraBusters invites everyone to tackle the pipeline at its root this coming week in Seale, Alexander City, or Butler, at your only chances in Alabama to testify in front of the Federal Energy Regulatory Commission about the fracked methane pipelines proposed by Williams Transco, Spectra Energy, and FPL. Plus later a SpectraBusters panel on the issues. Pipeline representatives will be present. for the Commission’s administrative record. or PF14-6 for Hillabee Expansion Project. Elected officials and candidates for public office are invited to a SpectraBusters panel discussion in Lowndes County, Georgia. Topics will include potential pipeline routes, property rights (eminent domain, property values), water issues (aquifer, sinkholes, springs), whether Florida even needs more power, better power sources (solar, wind, conservation, and efficiency), noise, health, and hazards. SpectraBusters and allies from all states are invited, and are encouraged to hold panels elsewhere. Sabal Trail, Spectra, FPL, Williams, and Duke: we don’t come to your internal company meetings, and you’ll hear from us at the Scoping Meetings. Why: Spectra Energy, which had compressor station leaks in Maine in January and in Pennsylvania last year, plus multiple fines by Pipeline Hazardous Materials Safety Administration (PHMSA) for corrosion and leaks, and a record $15 million EPA fine for PCB contamination, proposes a hundred-foot-wide gash through our lands for their huge 36 inch Sabal Trail gas pipeline from Alabama through Georgia to feed Florida Power and Light (FPL) and Duke Energy for no benefit to local citizens and rate hikes for FPL customers. A one-time payment is not enough for decreased property values, permanent destruction, and hazards of leaks and explosions, when FPL and Spectra and Duke would profit forever. The gas comes from fracking in Pennsylvania and Texas, destroying watersheds, farmlands, and drinking water. Conservation, efficiency, and solar power are cheaper and bring jobs and energy here where we need them. Environmental Awareness Organization of Auburn University (EAOAU). Greenlaw protects clean air and water. New York Climate Action Group (NYCAG) the Spectra struggle (and Williams Transco Rockaway Lateral Pipeline in the Rockaways of Queens, NY and the LNG port resistance in Long Beach, NY). Occupy the Pipeline, who fought the NYC extension on the Spectra Pipeline. Our Santa Fe River, protecting our most vital and vulnerable natural resource…water. Sane Energy Project: to fight fossil fuel and nuclear infrastructure, and encourage renewable infrastructure. Shale Property Rights, formerly Spectra Energy Watch. Sierra Club, America’s largest and oldest grassroots environmental group, exploring, enjoying, and protecting the environment since 1892. Stop the Pipeline: No eminent domain, preserve local character and environment, and pipelines == fracking. Students Against Violating the Environment (S.A.V.E.) Valdosta State U.
Wiregrass Activists for Clean Energy (WACE): clean and sustainable energy sources. WWALS Watershed Coalition, Willacoochee, Withlacoochee, Alapaha, and Little River Systems in south Georgia and north Florida. SpectraBusters: We ain’t afraid a no pipeline! 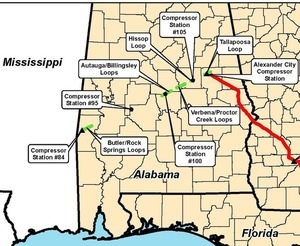 Landowners and others opposed to the Sabal Trail gas pipeline through Alabama, Georgia, and Florida. See also these presentation materials. Tackle the Pipeline at the Root: Alabama FERC Scoping Meetings; Seale, Alexander City, or Butler Alabama, 10,11,12 March 2014.